“Who, from the outside, would ever conceive of Proust’s stories of the supremely privileged as a subject suitable of an audience of famished, lice-ridden, frostbitten prisoners of war huddled together in bombed-out buildings?” Eric Karpeles, the translator of this slim but astonishing volume of lectures asks in the introduction. It is this image that the reader holds in mind as they encounter this remarkable historical document. In the fall of 1939, Jozef Czapski, a titled aristocrat by birth, was a 43-year-old reserve officer in the Polish army when he, along with 22,000 other Polish officers and soldiers were rounded up by the Soviet army. The vast majority were soon executed and thrown into mass burial bits. For unknown reasons, Czapski, and another 395 officers were spared this fate, and instead sent, in the spring of 1940, to Gryazovetz, a dynamited convent that now functioned as a prison camp, 250 miles northeast of Moscow. Freezing, overworked, and on the brink of starvation, the men were granted permission to hold evening lectures in which each speaker spoke on a topic of his choice. 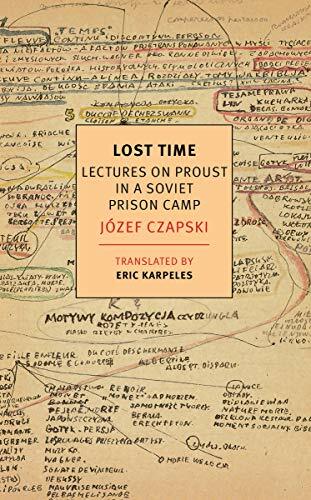 Czapski, a writer and painter who had spent years in Paris, chose to give a series of lectures about Marcel Proust’s six-volume master work on the themes of loss and remembrance, A la recherche du temps perdu, or in English In Search of Lost Time. As no copy of the book existed in the camp, Czapski composed his lectures in the form of schematic drawings, replete with references to artistic and philosophical movements, historical personages, biblical allusions, and literary criticism. Several examples, in both the original Polish and English translation, are included in the book, and to view them is to behold, in microcosm, a distillation of European Humanist culture, created at the very moment when it faced a very real threat of obliteration. Czapski gave his talks in French, and some time afterward, two of his listeners agreed to transcribe them as he dictated. After the war, Czapski supervised and published a Polish translation. The original French texts were not published until 1987, and it is from them, in consultation with the surviving Polish pages in Czapski’s archive in Krakow, which Karpeles has produced this translation. “I’m not making the case that the pages I speak about are the most valuable,” Czapski tells his audience. “It’s just a hierarchy subjectively fixed by my enthusiasm.” Herein lies the books significance. Set in the midst of one of the darkest moments of human history, between the horrors of Nazism and Stalinist Communism, it not only portrays an attempt to find meaning and comfort through literature, but it in fact enacts that attempt. The talks were given as a relic from a world destroyed, and Czapski was its emissary. As Czapski lectures on the “soil in which Proust’s creative sensibility took root,” he describes for his exhausted, tyrannized listeners, vistas of the French countryside, the dominant fin-du siècle artistic movements, and the fine points of Proust’s social milieu. Additional lectures delve into the actual content of the La Recherech, depicting Proust’s narrator’s relationship with his beloved grandmother, the delights and travails of Swan, Odette, Albertine, the Guermantes family, and Proust’s mediations on art. Working solely from memory, Czapski recounted what he subjectively remembered as key scenes and themes, as well as his own thoughts about the work. In spite of various small errors, what stands out in these transcribed lectures is the level of detail which he did manage to remember. “What does this relentless work by a virtually unknown artist mean, such an unremitting effort towards an end that probably no one will notice, or comprehend, or most likely even see?” Czapski quotes Proust, whose character, the painter Bergotte, asks as he contemplates a landscape of houses on a beach. Appearing here, in this extraordinary book, it poses a question on the value of art, which resonates far beyond the prison walls where it was once spoken to men who had lost everything. Janice Weizman is the author of the novel The Wayward Moon, a recipient of the 2013 Independent Publisher Book Awards Gold Medal and the Winner of the 2013 Midwest Book Award. Her short stories, essays, book reviews, and articles have appeared in numerous venues.